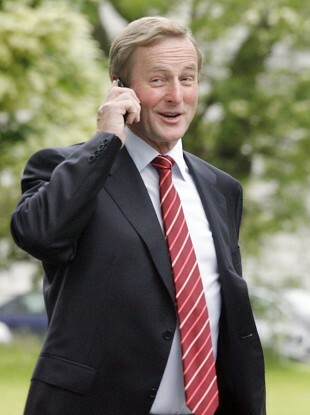 Enda Kenny on the phone, but who's listening? TAOISEACH ENDA KENNY has quipped that he always operates on the basis that his calls are being listened to as he condemned as “appalling” allegations that German chancellor Angela Merkel’s calls were tapped by US authorities. Speaking to reporters in Dublin earlier today, Kenny was asked about the claims which emerged yesterday that the US National Security Agency has monitored Merkel’s calls. He said: “I happen to be the Taoiseach of a small country. I think it’s an appalling situation if that were to be true. His comments come as Germany has summoned the US ambassador in Berlin to explain the claims which the US has partially denied, Obama telling Merkel that he is not monitoring her calls. But the US has not confirmed whether it did monitor calls in the past. Berlin has demanded “an immediate and comprehensive explanation” from Washington. The row threatens to overshadow a European Council summit getting under way in Brussels today. France also summoned its US ambassador in Paris on Monday to explain allegations in Le Monde that the NSA monitored millions of calls made by French citizens. Separately, Kenny said this morning that it is “absolutely critical” that EU leaders follow through on proposals for a banking union and to break the link between sovereign and bank debt. He added: “One of the failings or inadequacies of European Council over the years has been an inability to actually complete programmes where decisions are made. Email “Taoiseach on Merkel 'bugging' claims: 'I always operate on the basis that my calls are listened to'”. Feedback on “Taoiseach on Merkel 'bugging' claims: 'I always operate on the basis that my calls are listened to'”.